Home » climate and security » Is Climate Change Driving a New South Pacific Security Architecture? Is Climate Change Driving a New South Pacific Security Architecture? This is a cross-post by Nicholas Burke from Relief Analysis Wire. Last week, an inaugural meeting of South Pacific defense ministers took place in Tonga–an initiative spearheaded by Australia. Present were Tonga, Papua New Guinea, Australia, New Zealand, France, Chile, and (as an observer), the United States. Front and center on the agenda was collaboration on humanitarian and disaster relief operations, maritime surveillance, and plans to conduct joint exercises throughout the region. Immediately following these meetings, the New Zealand Herald is reporting that Australia and New Zealand are looking to strengthen their strategic ties. The key driver of this mutual concern that a variety of problems are escalating in the South Pacific islands. Australia recently briefed its new defense White Paper to New Zealand, in the midst of its completion of protracted engagements in East Timor and the Solomon Islands. The new strategic doctrine conveys marked concern about regional stability in general. Underlying issues in the South Pacific such as governance, crime, and high unemployment are being “compounded” by the effects of climate change, according to the White Paper. The Pacific Islands’ limited capacities to face a multitude of threats without the help of regional powers will be present for “decades” to come according to the assessment and the Herald. The inundation of low-lying regions, more frequent and severe natural disasters and shifts in rainfall patterns would lead to loss of agricultural production in some areas and potentially large-scale human migration. The combination of the effects of climate change and resource pressures will increase the risk of insecurity and conﬂict, particularly internal instability in fragile states, many of which have increasingly large populations in areas that will be affected by climate change. These factors, taken together, point to an increasing demand for humanitarian assistance, disaster relief and stabilisation operations over coming decades. Over the past several years, the Pacific Islands have faced a series of weather-related disasters and the threat of risings seas. One of the strongest La Nina episodes on record was a factor in three cyclones that struck Vanuatu in 2011 and triggered an agricultural crisis in the nation’s southern province. That year, severe drought also ravaged Tuvalu as part of the same extreme La Nina episode. Last year, Fiji suffered the worst flooding in its recorded history, and powerful Cyclone Evan caused serious damage in both Fiji and Samoa. Tuvalu and Kiribati are just two nations that are also battling the imminent threat of sea level rise, with Kiribati even considering the potential resettlement of its entire population to Fiji. The international community, Australia, and New Zealand have been engaged in some degree with all of these issues. With New Zealand observers participating for the first time alongside Australia and the U.S. in July’s Talisman Sabre exercise in the Coral Sea, one wonders if this is just the beginning of deepening Australia-New Zealand strategic cooperation in one of the most climate vulnerable regions in the world. 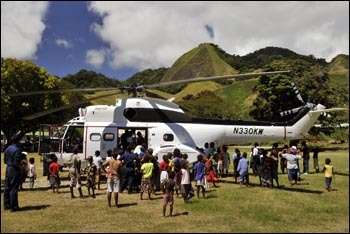 By Caitlin Werrell and Francesco Femia in climate and security on May 8, 2013 .